Wings give lift, enable new views, and allow soaring with seemingly no effort. Retailers and brands have long depended on the Three Ps of product, price, and promotion to be their wings, but the highly competitive landscape of multichannel and the empowered consumer are now defining the need for a new set of Three Ps, the productivity of places, processes, and people. Each of these offers tangible measures of enterprise performance that can be applied to quantifying the customer experience. The latter are fundamental to success in omni-channel retail. Omni-channel is the label given to a retail ecosystem that allows the enterprise to embrace and leverage online and mobile commerce while integrating these with their operating asset base of physical stores. The objective is to serve the consumer’s journey of discovery and fulfill their needs and wants through approaches that meet their ever-growing expectations. Continuously improving the productivity of places, processes, and people will also focus on increasing traffic and conversion as the imperatives of retail success, regardless of the channel. Physical retail stores and customer service locations offer the most engaging and immersive experience with customers for brands. The physical store, as a high-value element of the omni-channel strategy, warrants approaches and investment that contribute to the achievement of overarching brand goals, as well as specific outcomes. In a twist on omni-channel that offers more physical browse/buy options, rather than just widening existing customer paths to purchase, TJX Companies announced plans to launch a new off-price chain of home goods stores. This recognizes the importance of the shopping experience as an outing, with browsing and discovery. Digital customer experience can be described as a culture of business development and of change management to exploit the enabling effect of technology elements for ever-increasing benefit to all stakeholders. Visual communications and media presentation bring the in-store experience to life and help to drive engagement in other omni-channel elements. According to the Forrester Research Inc., Global Business Technographics Priorities and Journey Survey 2016, 73 percent of retail businesses identify that improving the customer experience is a priority. This is second only to increasing revenue. The same survey report reflected that 68 percent of retailers have made personalization and experience a priority, but 53 percent lack the right technology to personalize. The opportunity cost of poor customer experience is high. The TimeTrade State of Retail 2017 report declared that customer experience could boost a retailer’s revenue by 5 percent. This reflects that retailers missed out on a $150 billion payback during 2016. The TimeTrade Survey showed that millennials, in particular, would pay up to 20 percent more for a better retail experience, indicating that not only revenue, but also margins and loyalty can be dramatically impacted by customer experience. Visual communications and media presentation can bring the in-store experience to life for shoppers, while driving engagement with other omni-channel elements. Digital is the trim tab of the customer experience rudder. A trim tab is a small wing on the tip of a larger wing or a rudder that uses little energy to help move the larger wing or rudder that turns the vessel to its new course. Digital display images and messaging readily enable new approaches to improve customer engagement and experiences. The concept of the “endless aisle,” in which all inventory is visible to customers, is an example of integrating inventory visibility with online-enabled and in-store purchases. The display and interactive technologies to accomplish this are readily available and all interests are well served. Image presentation of High Dynamic Range (HDR) quality that can optimally present products in these and other categories enables a level of product promotion, merchandising, and representation quality that is essential to generating increased traffic and conversion, as well as premium pricing and margins. The Internet of Things (IoT) now provides a myriad of image-triggering mechanisms such as proximity and demographic detection, or “lift and learn,” in which product handling for examination enables product features and benefits to be communicated to encourage conversion, upsell, and cross-selling. Other types of flat panels for media and information presentation bring unique experiences to customers visiting the physical store. Transparent displays that present animated and video messages on a display area that is also see-through are well suited to retail windows, cabinets, coolers, and as fixture and architectural features. A digital mirror can overlay the customers’ body outline with product images. This reduces time and effort in the fitting room on the part of the customer as alternate products are more easily assessed and accessorized. Interactive display using touch or gestural navigation immerses the consumer and others of the shopping party in the discovery and selection of products. Gamification for entertainment and edutainment is well suited to interactive display. 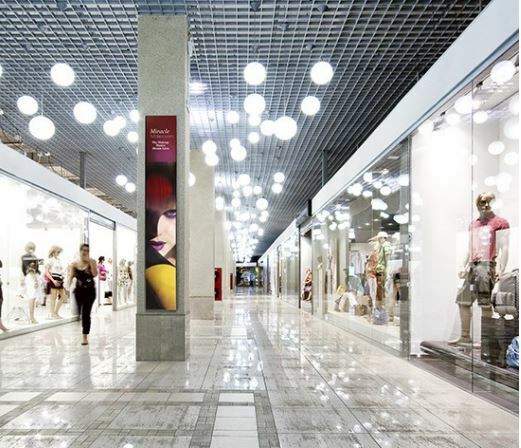 For some retailers, dynamic signage is a coping mechanism to bring vitality to tired-looking physical stores and a way of deferring investment in locations or departments that may be badly in need of upgrades. This “quick fix” of dynamic media can also buy time during which more thorough analysis and planning can be conducted . In all cases, dynamic signage and place-based media presentation deliver the simultaneous benefits of branding and merchandising along with improved ambiance and vitality. Robust media can attract shoppers to increase store traffic and deepen the shopper loop. 1) Drive traffic based on moments that influence purchase by engaging consumers according to what they want to know, do, learn, try, and buy. 2) Create better same store performance by digitizing approaches and automating them for greater efficiencies, economies, and productivity of places, processes, and people. 3) Provide moments of engagement and experience that are memorable. 4) Add a virtual aisle to bridge the in-store and online experience. This will include inventory visibility, cross selling, upselling, easy ordering, ship to a preferred location, and e-commerce. 5) Move customers to service approaches that best serve their shopping and buying approaches. 6) Promote using dynamic displays and personal engagement based on analytics. Analytics in retail is the science of integrating a customer’s needs, history, habits, likes, and wants. All these are in the head of the consumer and increasingly in the cloud, so retail success through analytics is moving information from the cloud to the eyes and hands of customers. The overwhelming force of value is the new inertia resulting in the assessment and the implementation of visual media. As in all retail improvements, change management is the critical success factor. Within omni-channel, the physical store must continue to serve brand interests and consumer needs for improved customer engagement. Dynamic signage gives omni-channel wings by improving the in-store experience and driving customers to online and mobile brand and product engagement. Digital displays give omni-channel wings.